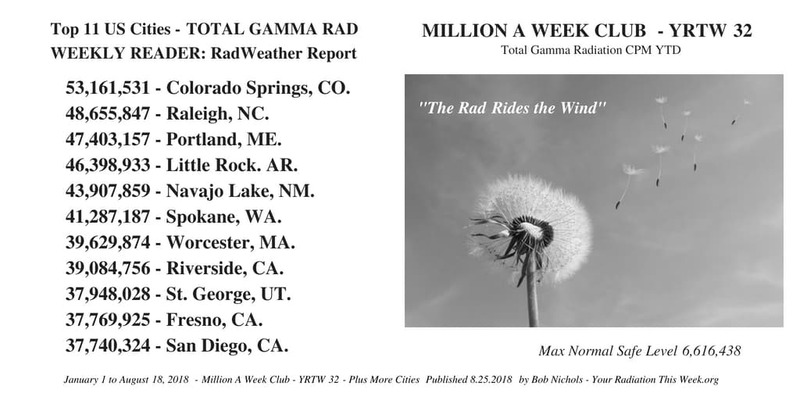 The Total Gamma Rad 2018 Annual Projection is just over 4.156 Billion Gamma Rad for the US. “This is a Bad situation for all who breathe,” states EU physicist Dr. Paolo Scampa. 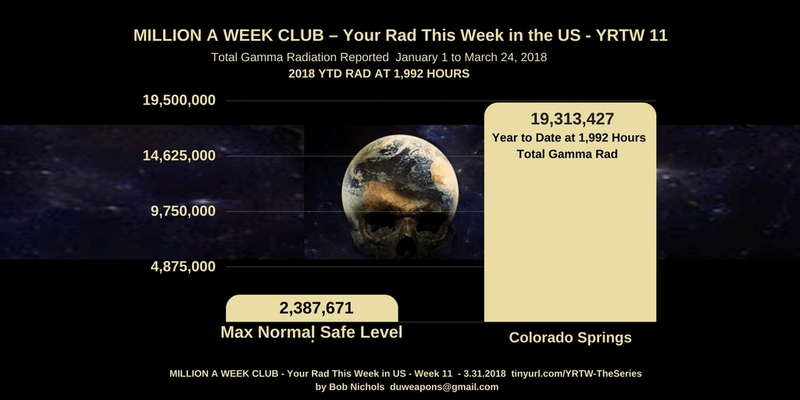 Now included, for the 50th Week of 2018 just passed, all cities above 50 Million CPM  Year to Date [YTD] of deadly Gamma Radiation. 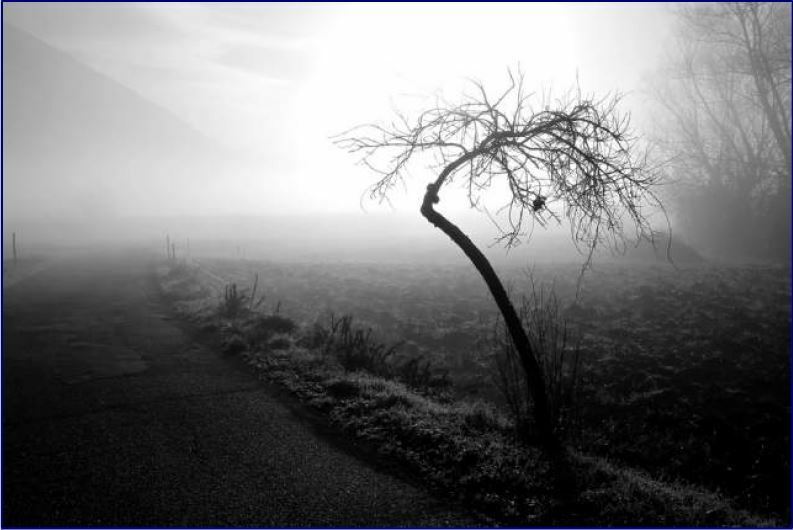 Today’s 356-day or 8,544-hour report for January 1, 2018 to December 22, 2018, is another case of Bad news from your radWeather Report. 97.53% [to December 22] of 2018 is gone. 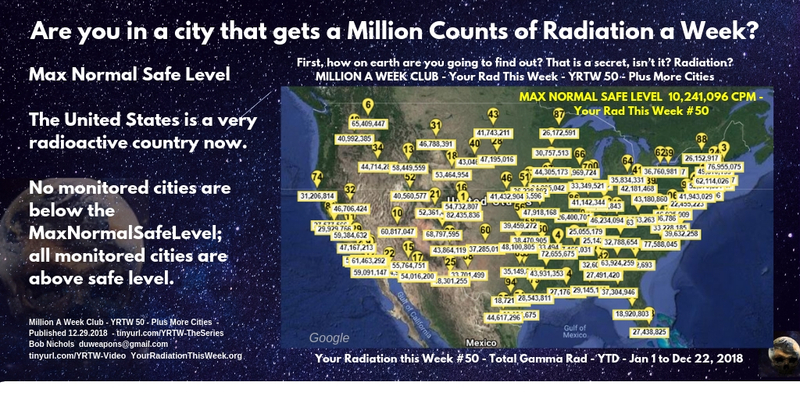 Within minutes or hours of publishing this list of cities over 50 Million YTD Counts of Radiation, four more cities will Zoom past 50 Million Counts of deadly Gamma Radiation since January 1, 2018. Cell assassins, like Plutonium 239, and its brothers were never around; they did not exist on this Planet. 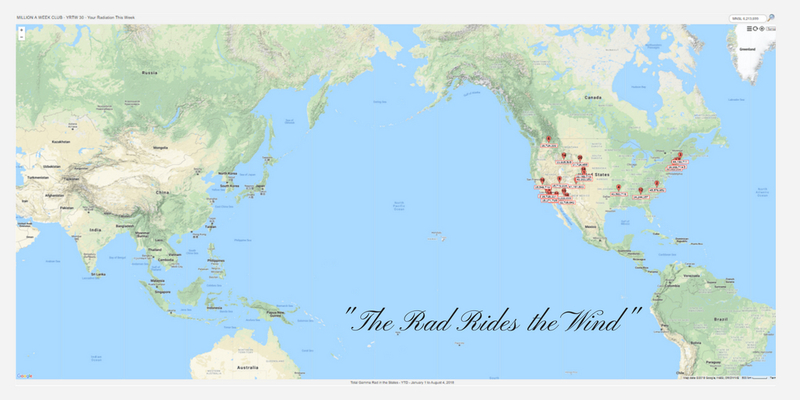 That will be 27 cities above 50 Million Rad Counts so far this year. YRTW ELE is published every two weeks on Saturday. ELE is an acronym for “Extinction Level Event.” The amount of Rad in the air now Dooms Humanity to a relatively quick Extinction; Done In by our own war toys, how moronic is that! I can’t say it any plainer than that. The next publication dates are June 17, 2017 and July 1, 2017 on the Road to Extinction. Lead Attorney Katsuyoshi Suzuki is the Super Lawyer who beat the combined forces the Tokyo Electric Power Company [TEPCO,] a hugecorporation and the Japanese government. He and the legal team are to be applauded world wide.